However, this is the first time Mr Draghi has spoken in depth about some of the biggest concerns about aggressive action by the world’s central banks. The ECB president defended the decision to launch QE and other easing measures unleashed over the past year and claimed there was little to suggest imbalances in the financial system had already emerged. He also noted that all monetary policies had effects on wealth distribution and inaction by the ECB would have incurred other costs. Mr Draghi argued that while the impact of QE on asset prices and economic confidence had been substantial, what ultimately mattered was what happened to investment, consumption and inflation in the eurozone. There was no inflation in the eurozone in the year to April 2015. The ECB targets a level of below but close to 2 per cent. The commitment to QE follows weeks of volatility in the market for benchmark German bonds. They suffered a dramatic sell-off amid speculation the ECB would taper its bond-buying following signs of economic improvement in the eurozone. Figures published earlier this week showed the region’s economy outpacing its US and UK rivals in the first quarter on the back of a spending spree fuelled by cheap energy prices and low inflation. Ructions of this magnitude are extremely rare in government bond markets. Investors are nursing almost half a trillion dollars in paper losses in two weeks, a staggering sum in what is supposed to be a rock-solid repository for institutional investors. French, Italian, Spanish and Portuguese bonds have all sold off sharply over the past two weeks, obliterating the gains in yield compression since the European Central Bank unveiled a bond purchase programme of €60bn a month in January. “Anything over-populated is being cleared out. People got too exuberant and they’re coming back to reality,” said David Bloom, currency chief at HSBC. Peter Schaffrik, at RBC Capital Markets, said rising yields can be a healthy development if the global economy is picking up speed. It is a different matter if they suddenly jump at a time of sluggish growth and disappointing figures in the US. “It is potentially dangerous. 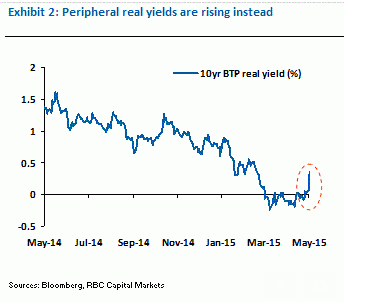 What worries me is that we don’t have a good macro-economic back-drop driving yields higher. We don’t see a reflationary recovery,” he said. Investors already face a changed world from early April, when deflation was still on everybody’s lips and Mexico was able to sell €1.5bn of 100-year bonds at a rate of 4.2pc. The worm turned two weeks later when bond king Bill Gross, at Janus Capital, declared that Bunds had become unhinged and were the “short of a lifetime”, quickly followed by warnings from Berkshire Hathaway’s Warren Buffett that bonds were “very overvalued”. The sharp moves have been exacerbated by a lack of liquidity as traditional dealers withdraw from the market to comply with stricter rules. The Institute of International Finance said this week that thin liquidity had become the top issue in talks with central banks and regulators. It said the new rules amounted to a “dramatic revolution” that had re-engineered the global financial system and pushed risk out into the shadows, storing up outcomes that are likely to be “pretty painful and certainly unknowable”. Global bourses have so far shrugged off the bond market crash but this may be untenable over time and there are already signs of jitters as the spring rally runs out of steam. Equity prices and bond yields tend to feed off each other, though the relationship is not always mechanical and there can be lags. Janet Yellen, chair of the US Federal Reserve, issued an implicit warning that Wall Street has got ahead of itself and may be vulnerable to monetary tightening. Markets have priced in a far slower pace of rate rises over the next 18 months than the Fed itself. “Equity market valuations at this point are generally quite high. They are not so high when you compare the returns on equities to the returns on safe assets like bonds, which are also very low. But the potential dangers are there,” she said. Confusion now reigns in financial markets. Brent oil prices have surged by more than 30pc since January to $67 a barrel and copper has risen in lockstep, normally a sign that the global economy is coming back to life and that inflation will follow in short order. The broad M3 money supply has been growing at a brisk rate on both sides of the Atlantic, reaching an annual rate of 7pc in the eurozone over the past six months. Yet closely-tracked indicators for inflation expectations - such as the “5/year 5/year forward rate” - remain depressed, especially in Europe. “There is no global reflation story. If I were able to find it I’d be doing cartwheels down the dealing floor but it is not there,” said Mr Bloom at HSBC. Investors piled into EMU sovereign debt late last year and in early 2015 in the belief that the ECB’s bond blitz would soak up the available supply, leading to a scarcity. Bunds became the favourite trade as the German government prepared a budget surplus of 0.5pc of GDP this year, eliminating roughly €18bn of existing bonds. This degenerated into a momentum trade. German yields continued dropping below zero as far out as eight years maturity, even as the deflation scare abated and Europe began to eke out modest growth. “We are seeing the unwinding of an enormous bull rally in the bond markets,” said Anthony O’Brien, at Morgan Stanley. “There was some complacency and a lot of lazy longs and bond prices have tumbled, but we don’t think this is enough to snuff out recovery." Barclays said the moves in the Bund market threaten to repeat events in Japan in 2003, when 10-year Japanese yields rose 110 basis points in six months after touching unprecedented lows on deflation fears. Investors were left nursing paper losses of 8pc, but the shock was not enough to derail economic recovery. Mr Roberts, at RBS, said the bond rout is likely to short-circuit once it becomes clear that the world economy is not out of the woods and that China’s leaders will continue to engineer a deliberate slowdown. All the forces that combined to fuel the eurozone recovery are already slowing or in reverse. “Oil is up, the euro is up, rates are going up in Germany and the core, and spreads in the periphery are rising. This is absolutely terrible for the eurozone,” he said. “There is going to be a monumental trade getting back into Bunds. All we are waiting for is a technical trigger,” he said. Only fools believe Washington is going to risk American lives over Ukraine or even Poland. Yet let’s plan a few steps ahead. If it ever comes to the unthinkable – a war between NATO and Russia in Ukraine – Russian defense circles are sure of conventional and nuclear superiority on sea and land. And the Pentagon knows it. 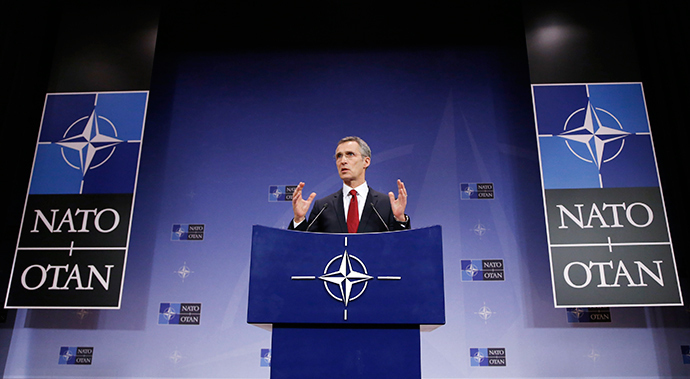 Russia would reduce NATO forces to smithereens in a matter of hours. And then would come Washington’s stark choice: accept ignominious defeat or escalate to tactical nuclear weapons. What Happens When You Hand Over Your Gold To The Bank Of England For "Safekeeping"
When Nazi Germany annexed the Czechoslovak border province of the Sudetenland in September 1938, it immediately absorbed a good part of the country’s banking system as well as most of Czechoslovakia’s strategic defenses. By then the country’s national bank had prudently transferred most of its gold abroad to two accounts at the Bank of England: one in the name of the BIS, and one in the name of the National Bank of Czechoslovakia itself. (Countries had deposited some of their gold reserves in a sub-account at the BIS account in London to ease gold sales and purchases.) Of the 94,772 kilograms of gold, only 6,337 kilograms remained in Prague. The security of the national gold was more than a monetary issue. The Czechoslovak reserves, like those of Republican Spain, were an expression of nationhood. Carved out of the remains of the Austro-Hungarian Empire in 1918, the Czechoslovak Republic was a new and fragile nation. A good part of the gold had been donated by the public in the country’s early years. Josef Malik, the governor of the national bank, and his fellow Czechs believed that, even as the Nazis’ dismembered their homeland, if the national gold was safe, then something of the country’s independence would endure. They were wrong. The Czechoslovaks’ faith in the probity of the BIS and the Bank of England was tragically misplaced. The gold was sacrificed, with barely a second thought, to the needs of transnational finance and the Third Reich. The Nazis’ first demand came in February 1939 when Berlin ordered Prague to transfer just over 14.5 metric tons of gold, supposedly to back the German currency now circulating in the Sudetenland. This was certainly an innovative idea— first invade a neighboring country, annex part of it, and then demand that the newly truncated state supply the gold to pay for the loss of its territory. The following month the question became academic. On March 15 the Wehrmacht marched into Prague. The German protectorate of Bohemia and Moravia was declared, and Czechoslovakia no longer existed. But the gold reserves did. Three days later a Reichsbank official was dispatched to the National Bank of Czechoslovakia and ordered the directors, under the threat of death, to issue two orders. Thanks to diligent detective work by Piet Clements, the BIS archivist, we have a clear picture of what happened next. The first order instructed the BIS to transfer the 23.1 metric tons of Czechoslovak gold held at the BIS account at the Bank of England to the Reichsbank BIS account, also held at the Bank of England. The second order instructed the Bank of England to transfer almost 27 metric tons of gold held in the National Bank of Czechoslovakia’s own account to the BIS’s gold account at the Bank of England. Malik and his fellow directors hoped that it would be obvious that the instructions had been issued under duress and so would not be implemented. The Nazis had just invaded Czechoslovakia and would obviously target the national gold reserves. But Malik had not reckoned on Montagu Norman. The governor of the Bank of England had no interest in whether Czechoslovakia was free or a Nazi colony. “Political” considerations must not affect the BIS’s transactions. The transfer order, he said, must go through. Beyen was unwilling to take a decision without authorization. But who could he ask? The chairman of the BIS board, Sir Otto Niemeyer, of the Bank of England, was traveling to Egypt and so was incommunicado. At 6 p.m. on March 20, Roger Auboin, the bank’s general manager, told Beyen that the governor of the Bank of France had discussed the matter with London. The Bank of England and the Bank of France would not be taking any action to stop the transfer, because they felt that there were no grounds for action. The BIS transfer order went through. With London, Paris, and Basel’s compliance, Nazi Germany had just looted 23.1 metric tons of gold without a shot being fired. More than two-thirds of that gold was traded with the Dutch and Belgian national banks and was eventually transported from Amsterdam and Brussels to the Reichsbank’s vaults in Berlin. Czechoslovakia’s diligent planning to safeguard its national gold reserves, together with its misplaced faith in the integrity of the new international financial system, had come to nothing. The second transfer order for the 27 metric tons held in the National Bank of Czechoslovakia’s own account at the Bank of England did not go through. Sir John Simon, the chancellor of the Exchequer, had instructed banks to block all Czechoslovak assets. But Czechoslovak gold held in a BIS account at the Bank of England, it seemed, was not defined as a national asset and was beyond the reach of UK laws. The real villain of the affair was Norman. Beyen, who later served as Dutch foreign minister and as executive director of the International Monetary Fund, was an ineffectual bureaucrat, paralyzed by the idea that he might have to take responsibility for a decision. Norman could have stopped the transfer immediately. He was the governor of the Bank of England, which held the two BIS accounts involved. At the very least he could have asked for the transfer to be referred to the BIS board for a decision, which would also have been a face-saving measure. He chose not to do so. It was clear that war was coming, one that Britain would have to fight. The Nazi invasion of Czechoslovakia had destroyed the last hopes of peace. That country’s gold reserves, held in London, were now a British national security issue. Yet Norman’s priority was not the best interests of his homeland, but rather the independence of his beloved BIS. Even as the shells were loaded into the German tanks, Norman still believed that for the bankers it could be business as usual. Nothing could interfere with the bankers’ sacred neutrality and gentlemanly trust in one other, not even the coming conflagration with a regime whose evil was now plain to see. The Bank of France had refused to stop the transfer but had also asked Norman to block it. Norman was adamant. There could be no political interference in the operations of the BIS, even, it seemed, when they were ordered at gunpoint. Norman even wrote to Beyen to clarify the matter and to assure the BIS president where his ultimate loyalties lay in Basel. Norman did not want to publicly correct the minutiae of what was being reported in the press and Hansard, the British parliamentary journal— that the Bank of England did not know whose gold was held in the BIS accounts— as that would expose him. “The difficulty is that if I point out to the Treasury that this is incorrect, I lay myself open to being asked details of BIS transactions, which I do not consider the Treasury are entitled to know.” This was little short of treason. As Norman’s compatriots were enlisting in the military, preparing to risk their lives for the freedoms and luxury that he enjoyed, as his country prepared for the war against the Nazis that all knew was coming, Norman blithely announced that his primary loyalty was not to Britain, but to a hyper-privileged, international bank that was not even a decade old. The mistake of Malik, the director of the National Bank of Czechoslovakia, was to believe that either Norman, Beyen, or indeed any of the BIS management could conceive of any moral or political dimension to their decisions. The world’s most powerful international bankers were not only unwilling to obstruct the Nazi seizure of Czechoslovak— or Austrian— assets. They simply could not conceive of any reason why they should do so. As long as the formalities were observed, the necessary papers were stamped and the gold was re-assigned. Norman’s precious independence for both the Bank of England and the BIS had been bought at a high price— in mountains of gold ingots to pay for steel to build bombs that would soon rain down on London. ... the affair had highlighted the deeply unsettling connections between the Bank of England, the British government, and the BIS. There was a good deal of cross-party feeling in Britain, reported the New York Times, that “the Bank for International Settlements should be liquidated before it furnished any more sinews of war to Germany, and that the odd relationship between the British government and the Bank of England should be re-examined without delay.” The New York Times then was able to assume that its readers would understand a classical allusion. The word “sinews” was a reference to an epithet of Cicero, the Roman philosopher, who had said, “The sinews of war are infinite money.” Cicero’s observation was as prescient then as during the late 1930s. But those who wanted the BIS to be liquidated were too late. Thanks to the BIS the “sinews of war” and the flow of near-infinite money were about to be immeasurably strengthened. Source: TOWER OF BASEL: The Shadowy History of the Secret Bank that Runs the World by Adam LeBor.